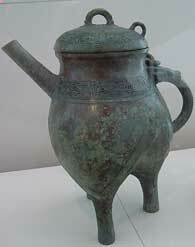 Around 2000 BC, people in China learned how to make bronze out of tin and copper, so we call this the Bronze Age. About the same time, people in China also developed writing. Like Sumerian and Egyptian writing of this time, Chinese writing is based on pictures that stand for ideas or sounds. Priests used oracle bones – bones with writing on them – to tell fortunes. People also wrote on bones and tortoise shells to keep records about who paid what to who, much like Linear B tablets in Greece at the same time. It’s likely – though nobody is sure yet – that the reason people in China began using bronze and writing about 2000 BC is that they were talking to the same people who brought writing to Greece about the same time – the Indo-Europeans (the Yamnaya). During the Shang Dynasty, people also began to use horse-drawn chariots with spoked wheels. Central Asian people invented chariots about 2500 BC. Probably those same migrating Indo-Europeans rode their chariots to China and to West Asia soon afterwards. People in China used jade (a green stone) for jewelry and decoration, and probably as a kind of money. By about 1800 BC (the traditional date is 1766 BC), the Shang had become the first to unite a big part of China under one king. Probably they used their great new military weapon, the chariot, to conquer China. Under the Shang, China’s influence reached south into Vietnam, where people also started to grow rice, make pottery and use bronze tools and weapons. The king had his capital in Anyang, in northern China. People had already begun to divide up into the rich and the poor. We know that some people were slaves under the Shang. Many men were in the king’s armies. The Shang Dynasty ruled China for about 700 years. But finally the Zhou conquered them, about 1100 BC. Did you understand this page? Take the quiz and find out! Eyewitness: Ancient China, by Arthur Cotterell, Alan Hills, and Geoff Brightling (2000). , with lots of excellent pictures. China (History of Nations), by Greenhaven Press (2002). For teens. The negative review on Amazon is actually for a different book – don’t be alarmed! The Cambridge History of Ancient China : From the Origins of Civilization to 221 BC, by Michael Loewe and Edward L. Shaughnessy (1999). A more challenging read, and much more expensive, but it has all the good solid reliable information you could want. Cite this page: Carr, K.E. 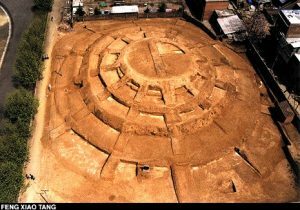 Shang Dynasty China – The first dynasty of ancient China. Quatr.us Study Guides, June 6, 2017. Web. April 18, 2019. What did they use to travel during the Shang Dynasty?! Mostly people walked where they were going. If people were disabled and couldn’t walk, or they were babies, other people usually carried them. For long-distance travel, the most common way was by boat or raft, where you could use the power of the water or a sail in the wind to power your vessel. Some people had donkeys, or ox-drawn carts. Rich people also rode horses, or rode in horse-drawn chariots. Wow, that made my day! Thanks, Izayah!